Lily here. the weather is turning cooler and the colors are beautiful. I like to sit on the window sill in the warmth of the house and enjoy everything that’s happening out there. I hope you are enjoying fall (whatever fall looks like in your neck of the woods). I am purrticipating in the Friendly Fill Ins blog hop. You can hop too, just go over to our friends 15andMeowing or Four-Legged Furballs. and join in the fun. 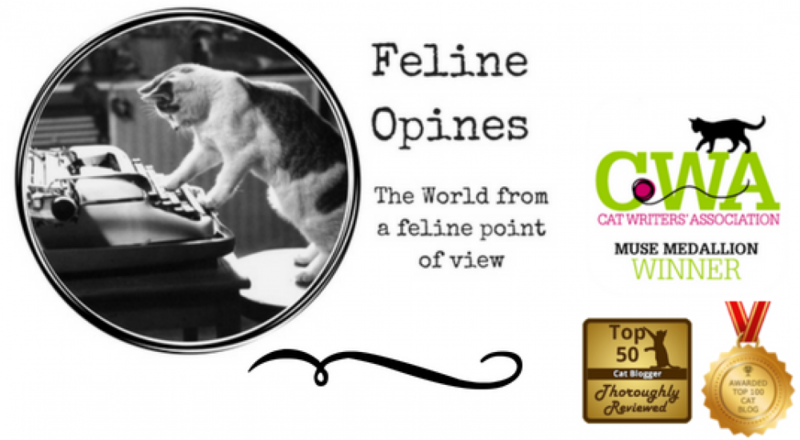 If you purrfer, you can always opine about your answers in the comment section of this post. 1. My favorite font is ..well at first I had to ask our Purrsonal Assistant what a “font” is. After she explained to me that it’s different of styles for words. I had her search the web for feline fonts and found this one which I think is purrfect and yes, it is my favorite font! 2. October is perfect for cuddling up to your favorite nap buddy, Tucker. 4. I feel very sad that my summer upstairs deck outings are coming to an end this time of year. Tucker here. I hope you’re enjoying your Friday. The Tribe of Five is getting ready for a relaxing Caturday but before that, I am sharing my fill in answers this week. This blog hop is hosted by 15 and Meowing and Four-Legged Furballs and you’re invited to join in. If you’d rather opine about your answers here, just note them in the comments. Have a great weekend and thanks to all of you who sent prayers and good wishes to my sister Jasmine. She is doing better and we’re grateful! 1.A fresh, new box brings out the best in me. 2. Getting my breakfast or dinner late makes me grumpier than Grumpy Cat. 3. If money grew on trees, I would have The Humans buy a furry throw for the sofa to enjoy my morning, mid-morning, afternoon, mid-afternoon and evening naps. 4. I have a fear of the evil vacuum monster. Oh no, she’s taking out the vacuum monster! Jasmine here. I am talking to you about this important day because I’ve been seeing quite of bit of the folks in white coats the last few weeks. Even though The Female Human takes us all to that place every year for wellness exams, sometimes things still happen. In my case I became very sick and was diagnosed with kidney disease. The Humans are giving me sub-cutaneous fluid every other day and antibiotics and I am beginning to feel better and am putting on a little weight. You say, when you go to the vet for regular wellness visits they have information that makes it easier to diagnose you and to help you. Even though I’m a lady kitty a bit advanced in years, my vet, and yours, can help you to be your most healthy self. Please make at least a yearly wellness visit to your vet!